Consumption! Capitalism! Consumerism! Christmas! We’re hitting pause and engaging the heart of consumption, capitalism, consumerism and most importantly, the heart of Christmas. What does it mean to celebrate the birth of Jesus, a poor kid from Nazareth who learned his father’s trade and had nowhere to lay his head? 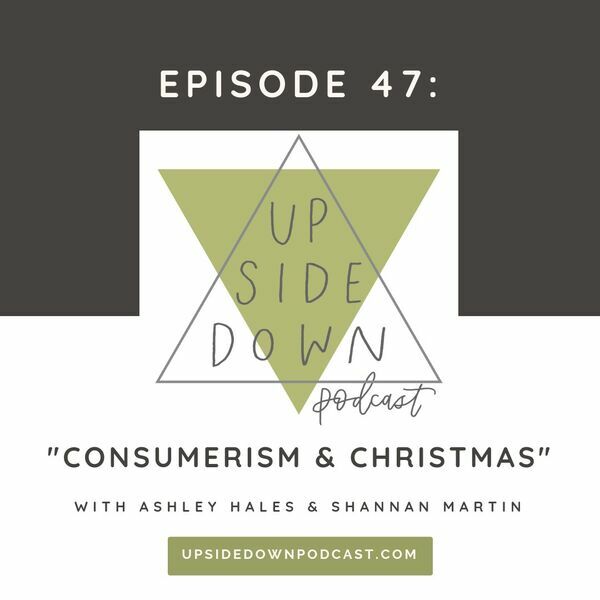 Ashley Hales and Shannan Martin join us as we ask: How do we opt out of the glitz and glitter around us to make space in our homes for the baby Messiah born in a manger? Shannan Martin, author of “The Ministry of Ordinary Places,” is a speaker, blogger, wife, and mom of four. Ashley Hales is a writer, speaker, pastor’s wife, and mother of four. She is the author of “Finding Holy in the Suburbs: Living Faithfully in the Land of Too Much.” Ashley and Shannan join Kayla Craig and Lindsy Wallace for a conversation about staying Christ-centered in a season of excess. Think about how we can emulate the life of Christ as consumers. Join us as we discuss how we can celebrate Christmas in a capitalistic society while emulating the life of Jesus. Listen to our conversation on ethical fashion with Lauren Pinkston of Wearthy (episode #32). If you’d like to support us to keep Upside Down Podcast ad-free, please visit us here, where you can pledge a few dollars of monthly support to help us pay our bills and keep the conversations going.